Anothology of Hindi Short Stories, which originally appeared under the title Hindi Kahani Sanghrah is an excellent section by Bhisham sahni of the best stories written in Hindi during the last few decades. 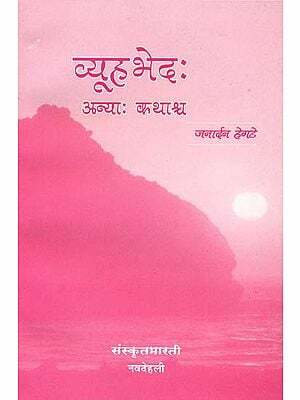 It features over 25 stories by well known writers like Amrit Lal Nagar, Bhisham sahni, Mohan Rakesh, Amrit Rai, Kmleshwar, Markandaya, Nirmal verma, Mannu Bhandari and Ram Darash Mishra. The stories are marked by a wide variety of themes, mostly related to contemporary social life, mostly related to contemporary social life, like alienation, loneliness, weariness and the crisis of values. The English translation retains the flavor and charm of the original in Hindi and is a must for these who desire to have a glimpse of the richness of contemporary Hindi literature. bhisham Sahni (1915-2003) born in Rawalpindi (now in Pakistan), was educated at Government college, Lahore. After coming to Delhi he taught in a college. He worked as a translator at the Foreign about seven years and on returning to India resumed teaching, So far he has published eight collections of short stories, four novels, three plays, a biography of his brother Balraj Sahni and several translations. He was awarded the Padma Bhushan for Literature in 1998 and Sahitya akademi fellowship in 2002. For his novel Tamas, he won Sahitya akademi Award in 1975. Jai Ratan, the translator, was born in Ludhiana in 1917 and now lives in Gurgaon. Apart writings of his own, he has translated extensively from Hindi, Urdu and Punjabi into English. He has over three dozen translations to his credit. He has also edited several anthologies. He is the recipient of the ‘Dwivagish’ Award (1991) and very recently the Sahitya akademi Prize for Translation (English). I accepted this assignment of the Sahitya Akademi with great enthusiasm; as I have an abiding interest in the art of the short Story. I felt I had had close professional links with the writer’s literary creations of my own generation as well as with The generation that followed mine. Added to this was the fact of my own close involvement with the various movements that en from time to time in the sphere of the short story would be interesting as well as easy, I thought. It was question of bringing together a couple of dozen stories. But the task was not as easy as I had presumed. Problems cropped up from the word ‘go’. The first question that arose was: should I draw up a list of authors or a list of outstanding Stories? When I started drawing up a list of authors it became Longer and longer. Not twenty-five but fifty names contended for inclusion, not because so and so was my friend, or that so And so thought like me and therefore deserved a place or that so was hostile and if I did not include him he would Accuse no of favoritism, or that so and so, though not contort have made the grade in the eyes of the readers, had done so in mine, etc. Not for these reasons did the list grow long but, because during the last thirty-five years, undoubtedly significant work has-been and is being done in the field of short fiction. More writers than ever before are seriously concerned with this art and are enriching our literature with their work. What was I to do? Whom should I retain, whom exclude? I decided upon a master list of outstanding stories. It would be easier to finally select twenty-five stories from this master List. Now another question stared me in the face. Was I expected merely to select twenty-five unparalleled stories or stories that were also representative of their age? Without being a literary masterpiece a story maybe significant even if it is not a literary masterpiece. It may give a new direction to the art of story writing; give it a new perspective, so to say. It may be a commendable effort in the task of breaking new ground, possess a freshness of tone, and give the sense of being a trendsetter. It may suggest a breaking of boundaries, may give the feel that the writer’s sensibility was struggling to capture some vibration in the environment. And then, what if the outstanding stories happened to be about urban life only? People might well ask whether all writers had deserted the village! And what if all the outstanding stories had the same tone? All with high-sounding intensity or all didactic and moralistic? People would ask if the founts of romance and humor had dried up in the Hindi short story. But this was also none too easy a task it did not seem right to me to first basify stories into stories of city life, of rural life, domestic life, of women’s life, etc. Or into stories of humor, of the middle class, the lower middle class, existentialist stories, socially conscious stories, stories representative of particular literary movements, stories of Muslim or Hindu milieus etc. This would make my task mundane and mechanical, which I did not like. Another problem: should I select stories only by writers who were primarily known as short story writers and had made their mark in literature basically through this genre? Or was I free to include writers whose main contribution did not lie in the field of the short story but in other artistic or cultural fields, but had in passing happened to write some good stories? Some writers are essentially poets, or painters or journalists; what was to be done with their stories? Or with the stories of those, who; on their entry into the literary field, worked full tilt for some years, wrote many stories, and then gradually moved into other fields such as publ1s1ing or journalism? For that matter there was Guleriji who had left behind a host of literary descendents, who had fired just a couple of arrows in the field of the short story but those arrows had made their mark What was to be done with the stories of such writers? The question was not whether to include them or not. The question was whose stories should be removed from the list in order to make room for their stories? Should priority be given those who had devoted years to the art of the short story genre, had refined it, chiseled and shaped it, and had made it their main medium of expression, or to those who had in passing produced a couple of memorable stories, and then, eating bored, had turned to other fields? And then there were some others such as Ramnarain Shukia, rahim Sharif, Raj Kamal who had met an untimely death, those who were just coming into, their own when the pen fell ftc their hands. These writers might have influenced the course of the short story writing, but they had certainly contributed to it. Sinking deeper and deeper into the morass of selection, I began wonder whether my own selection could be called impartial. I myself dim to be a story writes what kind of a writer is one who finds the same stories outstanding that others do? If all stories evoked the same response, why indeed, the stormy disputes and denunciations that are so much more marked in the domain of the story than in other branches of literature? Where was the guarantee that my selection would be impartial and objective? I have my own preferences and these could come in the way. Various controversies are going on among us about form and content in the story, about its aims, about its structure, about the relationship between the author and the reader, about the writer’s sense of commitment. I have my own views on these questions, and even while trying not to inflict views on others could I avoid doing so? So on and so forth. There were hordes of such questions that made my task difficult In a way I am offering an argument in my defence, by dwelling on all this. I was really hamstrung by the fact that in an anthology of a specified length it was just not possible to include all the representative stories I had in mind. Some stories had to be left out, for one reason or another. But if this collection succeeds even to some extent in providing a glimpse of the post-independence short story if it helps us feel the pulse of our times, I shall consider it a worthwhile effort. Story writing is not a conscious activity in the sense that the writer makes a conscious effort to communicate to the reader a sense of the times by using the medium of the story A story worth the name is never written with that kind of deliberation. It is the story writer’s sensibility that determines the direction of the story not the writer’s theories or hard and fast convictions. To my mind, the form of the story too, is not anything separate or distinct that can be used as a wrap or a guise that can be used for its own sake. The emotions rising in the writer’s mind bring with them their own forms of expression. Form and content are one it is not that the emotions comes first and then to give shape to it, the writer, with a calm, deliberate mind chooses a framework in which to fit the emotion, its theme and substance. Just as the line comes whole, to the poet, complete with emotion, word, and rhythm, the story too, from its very first line, finds its own form or mode of expression, feels its way to it, and shapes itself as it goes along. In saying this, I do not in any way minimize the writer’s judgment, logic, values or structuring of form. All these are significant, but only after absorption into the writer’s sensibility, and expressed as organically one with it. The writer’s sensibility, through its network of predispositions absorbs its environment, lives and breathes in it. Therefore, a story written in a particular period of time cannot but be colored by that time and its atmosphere. The stories written before independence and those written 20 or 25 years later are bound to be different, considered from this premises. In the development of the story we do not come across milestones or stages, we cannot state categorically that after a particular event the story changed its form and substance, or that the hold of traditional values and beliefs abruptly slackened. That is never how it happens. No matter how strongly a writer denounces tradition it stays in some form or other intermixed with or latent in the changed environment. But with changing times its impact begins to slacken. And we begin to sense a new vision, a new grasp. For instance, in my childhood, Mother India was often imagined as a woman in chains, and in accordance with this image literature came to be marked by voices singing of sacrifice and of an idealized freedom.